To provide the best service for your customers, you need to understand how your customers feel about your company – what you are doing right and what you could improve. Our voice of the customer solution makes it easy to gather this information. After an interaction – a call or SMS chat, say – send an email or SMS message to the customer asking them to complete a short survey about their experience. Our customer feedback solution records all replies, and you can then use this data to implement improvements within your organization. Our customer feedback solution supports two types of survey: SMS surveys and web surveys. With an SMS survey, Syntelate XA sends the customer a series of SMS messages, each asking one question. Questions typically ask the customer to give a rating from 0 to 10, and when the customer sends their response, this triggers Syntelate XA to send the next question. With a web survey, Syntelate XA sends an email or SMS message to the customer with a hyperlink to a web page. The customer visits this web page and completes the survey there. We’ll design your web survey for you according to your requirements and using your company’s branding, or you can use your own web designer. Of course, you can also use an online survey tool of your choice, although in most cases we’d suggest against this approach. Data is most powerful when it’s interconnected, and a bespoke solution ensures that your survey data is fully integrated with the rest of your contact center data. You’ll have full control over when to send survey invitations out to customers. Perhaps you only want to request feedback for inbound calls but not other types of interaction; or perhaps you want to request feedback on interactions involving newly trained agents but not more experienced agents. With Syntelate XA, it’s all possible. Your agents are the heart of your contact center: they’re the ones who speak with your customers day in, day out. That of course makes them very well placed to advise on things like process improvements or ways to increase customer satisfaction, but all too often their input just isn’t gathered – their ideas go unheard. Our voice of the agent solution addresses this. The way it works is simple: at the end of an interaction (such as a call or web chat), a message box appears asking for agent feedback. The agent takes a few moments to answer these questions, and then they move on to their next interaction. 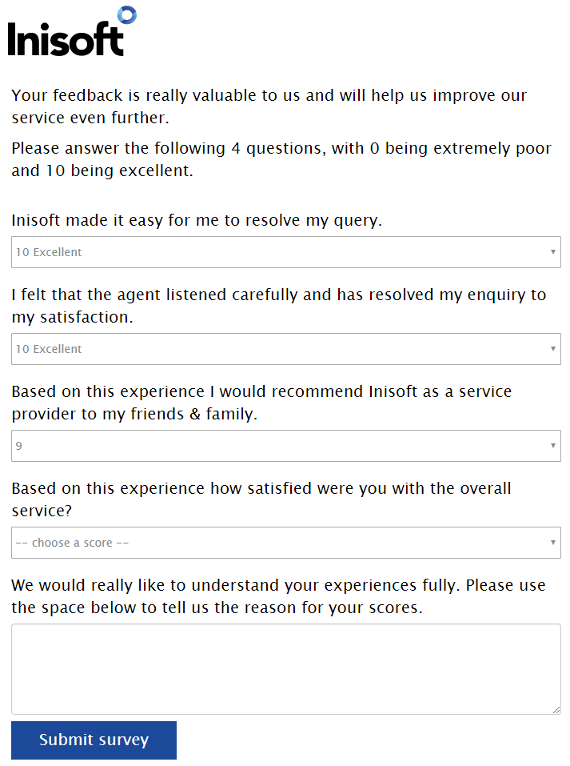 Syntelate XA records the agent feedback, and you can use this data to implement improvements to your contact center. For example, use this information to inform training. After all, who better to advise on agents’ training needs than your agents themselves? What questions you ask your agents is up to you. You can also change the questions asked based on the disposition code that the agent selects when ending the interaction. 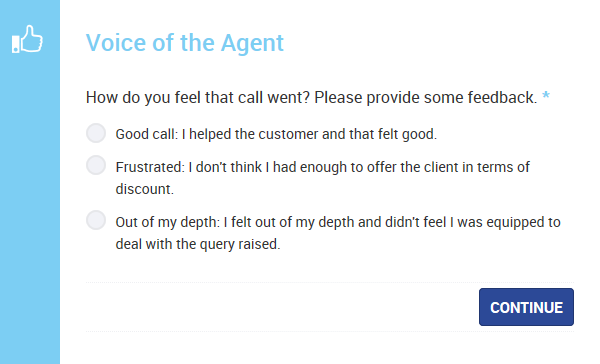 For certain disposition codes, maybe you don’t want to gather agent feedback at all – no problem. With Syntelate XA, it’s easy to ensure your agents are asked the right questions at the right time. Use our Dashboards module to show the data that you gather visually. See at a glance how your customers are feeling or how you agents are doing and what they’ve been working on.